Joe Abruzzese oversees all advertising sales for Discovery’s suite of U.S. networks, including Discovery Channel, TLC, Animal Planet, ID: Investigation Discovery, Science Channel, Discovery Fit & Health, American Heroes Channel, Destination America, Velocity and Discovery Life Channel. He also directs advertising sales efforts for Discovery Communications digital sales platforms. Abruzzese also played an integral role in leading the launch sales strategy for the transition of Discovery Health Channel to OWN: Oprah Winfrey Network. Under Abruzzese’s leadership, the Discovery Communications advertising sales team has been consistently ranked as the #1 cable sales organization in overall service, sales representative competence and Upfront presentation (Beta Research Advertising Executive Study). Before joining Discovery in 2002, Abruzzese held the top sales post at CBS for 11 years, responsible for all network sales efforts on behalf of CBS entertainment, sports, daytime, news, late night, the UPN networks and CBS Internet sales. He restructured and expanded the CBS network sales division, integrated the UPN sales force and quarterbacked landmark deals, most notably the corporate sponsorships necessary to launch the “Survivor” series. Abruzzese joined CBS in 1980 and held key sales positions in divisions such as daytime, children’s, sports and late night before taking the helm for overall network sales. Before joining CBS, he worked for NBC for 10 years in sports sales, planning and business affairs. He launched his sales career at the J. P. Stevens Company in New York. Among his many industry honors, Abruzzese was inducted in to the Broadcasting & Cable’s “Hall of Fame” in 2011 and has been named a “Media Maven” and a “Media All-Star” by Advertising Age and Mediaweek respectively. 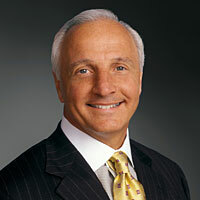 His civic and industry commitments include board positions on the National Kidney Foundation, Seton Hall Board of Regents, Louis Carr Foundation, Boys Hope Girls Hope, International Radio and Television Society Foundation, Inc., Cabletelevision Advertising Bureau, Family Reach Foundation, and NAPTE (National Association of Television Program Executives). Abruzzese has also been honored in the Newark Athletic Hall of Fame. A native of Newark, N.J., he earned his bachelor’s degree in marketing and finance from Seton Hall University.